We’d love your help. Let us know what’s wrong with this preview of The World According to Thor by Marc Sumerak. While battling dangers from the nine realms, Thor shares his outlook on life, love, and war in this immersive new volume. Whether it’s handling mischievous siblings, defeating the Frost Giants, or falling in love with a mortal, Thor’s experiences span centuries. With remov See the world through the eyes of the Norse Super Hero in this immersive journey into Thor’s universe. To ask other readers questions about The World According to Thor, please sign up. I have to let you know that I am a big Thor fan. Not as much as a Spidey fan, but close enough. After all I didn't give him the name Peter Parker. I named him Thor. So yeah, I'm a fan. I pretty much knew Thor's history and such, but, I'll be the first to admit that I don't know everything, and I forget half of what I learn. So this was a nice refresher and I even learned a couple of things new to me. Let's start out with first how awesome the illustrations are in this tome. Freddie E. W I have to let you know that I am a big Thor fan. Not as much as a Spidey fan, but close enough. After all I didn't give him the name Peter Parker. I named him Thor. So yeah, I'm a fan. I pretty much knew Thor's history and such, but, I'll be the first to admit that I don't know everything, and I forget half of what I learn. So this was a nice refresher and I even learned a couple of things new to me. Let's start out with first how awesome the illustrations are in this tome. Freddie E. Williams knocks it out of the park with the drawings of the 9 realms and of all the heroes and villians. As a comic book fan alone, the artwork is enough for you to keep this on your nerdy coffee table. Absolutely tons of fun. Whereas the Iron Man one felt a little childish at times this one feels it can suit all ages and fans. 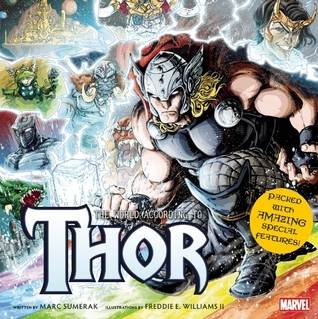 Crammed with beautiful art work and entertaining facts and back stories about The Mighty Thor, The Warrior's Three and everyone's favorite Trickster God. Also Throg! Worth a read. Funny as hell, has amazing artwork, practically perfect. In fact it would have been perfect if the 'AMAZING special features' weren't glued to the bleeding page so they rip when you try to put the little 3D hammer together.